It would be really convenient if one’s universal remote control could not only control the TV, but also every other electric appliance in the room. ZaZaRemote is a hybrid touchscreen/button remote control that uses infrared (IR), 2.4G-radio frequency (RF), Bluetooth and Wi-Fi. It can remotely control all IR electric appliances, including TVs, set-top boxes, projectors, DVD players, audio devices and air conditioners. The programmable remote also serves as a home security assistant, reporting its sensor’s data to the user’s mobile phone. ZaZaRemoteControl’s sensor can detect smoke and gas, and sets off an alarm to inform users of such dangers via their mobile devices. ZaZaRemote works in conjunction with an Android and iOS mobile app. Its two IR LEDs enables it to work within a distance of 60 feet, with a coverage angle of 150 degrees. It also has the ability to penetrate two floors to control lamps. ZaZaRemote ships in February at future pricing of $149. But Indiegogo backers can order one with a pledge starting at $89. Its makers are out to raise $100,000 by Dec. 17. There’s loads of competition for a device like this. 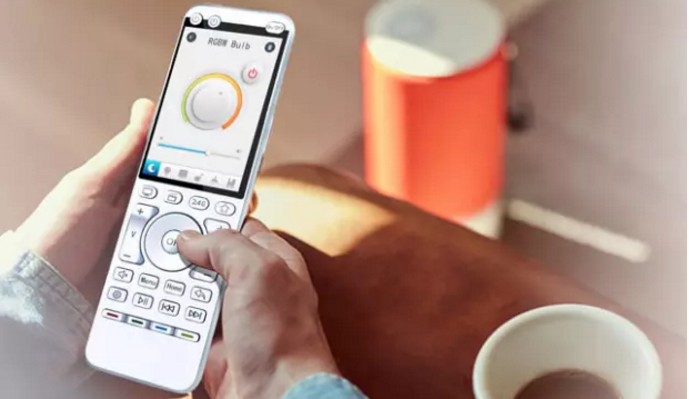 While ZaZaRemote clearly does a lot more than a traditional universal TV remote, its look — sort of a cross between a typical remote and a flip phone — lacks the original design of a remote like the Spin remote.